Notes: Dunseverick Castle is situated in County Antrim, Northern Ireland, near the small village of Dunseverick and the Giant's Causeway. Dunseverick Castle and earthworks are Scheduled Historic Monuments in the townland of Feigh, in Moyle District Council area, at grid ref: C9871 4467. 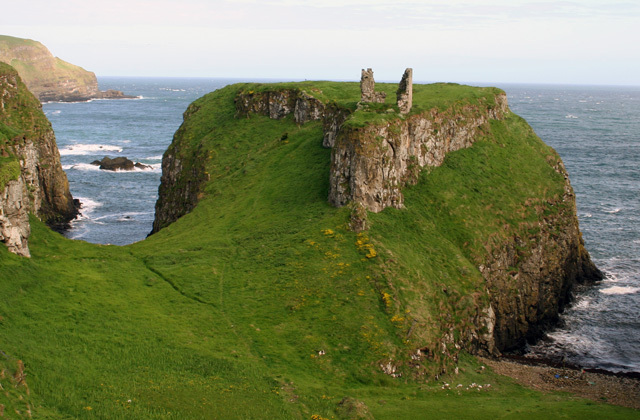 Dunseverick Castle and the peninsula on which it stands were given to the National Trust in 1962 by local farmer Jack McCurdy. The Causeway Cliff Path also runs past on its way to Dunseverick Harbour to the east and to the Giant's Causeway to the west.